Maslow v Internet … cont. We’d not done too bad in Sancerre during week one, with a modicum of slow WiFi being available in the apartment, week two in St. Gengoux le National was however, considerably different. Back in June, when we’d visited Spain with my brother and Debbie, his girlfriend, we’d had no internet access whatever and I detailed the sort of things we missed at that time. 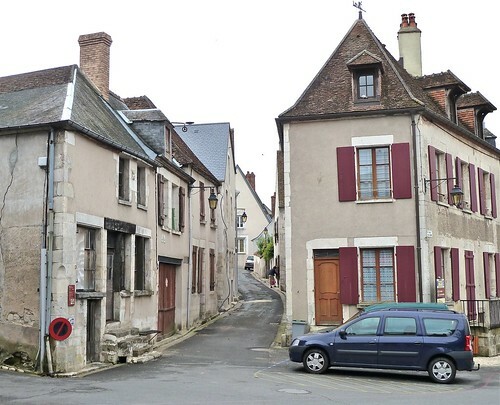 On July 1st however, T-Mobile our ‘mobile’ provider introduced a scheme where we could buy limited amounts of connectivity – so our visit to France could easily be covered by buying into that. 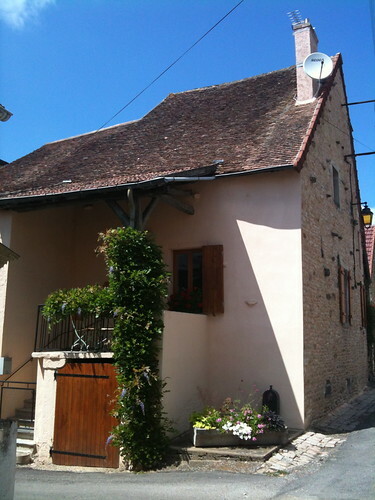 Once we arrived at our gite in Burgundy we found that even T-Mobile’s cost effective package would be no use. In the house itself we had no connectivity whatsoever, except late at night a cloud of ‘E’ floated in and out at whim! ‘E’ = EDGE. I’m not sure that EDGE ever caught on at home, I barely noticed the difference between it and GPRS and once you’ve experienced 3G (or more especially, super-fast broadband via WiFi) you find it grindingly slow. Yet the entire region only had EDGE access, even walking up the road meant a tiresome wait for downloading emails (i.e. 2-3 minutes rather than fairly instant). Finding ‘stuff’ on the Internet was similarly slow – we had to go for a drive, to find some 3G so that Sharon could research cures for a small medical problem. Which is where we come right back to Maslow. Both lower levels (safety and physiological) are different in the 21st Century to what they were 50+ years ago. We no longer rely on the doctor to tell us everything; we also look it up on the Internet. I wanted to express my love (mid-level) by taking us on a TGV trip to Paris but couldn’t access the site! Most of the simple ‘online’ things we now take for granted were not avaialble to us. Now, I realise that connectivity is not something everyone want when they go on holiday, but an ever increasing number of us do. 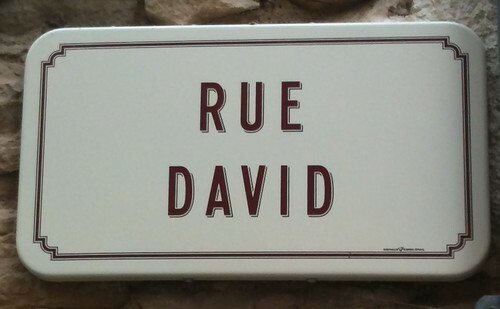 It occurred to me whilst we were driving up from Lyon to Sancerre that we really do rely a great deal on signs and signage in our lives. When one (like me) doesn’t have full command of a language, one has to rely on well-considered signage to receive relevant (and irrelevant) information, which might otherwise have been received aurally. The language I’m meaning could be just that – a language (in my case French), but it could also be anything new; anything that we are learning is just like a new language, so if we teach, we should also understand signs. I’d been thinking of our stay in the hotel the previous night. Much of the signage around it prevented me from having to ask difficult (given my mastery of French) questions. The signs around the hotel and the restaurant had sufficient semiotic links to allow my full comprehension. In the motorway service stations however, signage for the toilets were as obscure as ever with a great deal of thought being required before deciding which one to enter. It’s the same at home though, various places use toilet signage that beggar belief. How do we decipher these signs? What is it in our cultural make-up that determines the difference between one sign and another? No one ever taught me the difference between those male/female symbols (circle + arrow/cross) but I eventually worked it out and tested my theory against common practice. But that needed time – when you’re dying for a pee you have precious little time to decide whether the goat with horns or the goat without is Ladies/Gents! I did however, work out the difference on the service station we’d stopped at for a coffee. The two images were so similar that it took a short while to work out. The working out didn’t take too long but the checking my theory against practice took slightly longer as the door of my choice seemed to have women queuing outside. Still – full of confidence (not), I entered the loo and found a slightly shorter queue of women standing outside the cubicles, whilst the urinals stood empty. My theory had been proved by the sight of urinals but confused by the queue of women (and the small group: 2 men and one woman stood talking just inside the door). The situation I found myself in reminded me that despite the short distance between our two countries, France and the French way of life is very different to our own: If the Ladies is closed for cleaning, then the Ladies will use the Gents – why not? My most recent (final) two roles were in London at the RSC London ‘eFactor2012’ event, which took place in the magnificent Senate House, close to Russell Square and at Hartlepool College’s superb new build for RSC Northern. I wasn’t at my best for the London event having contracted a mild dose of man-flu earlier in the week. 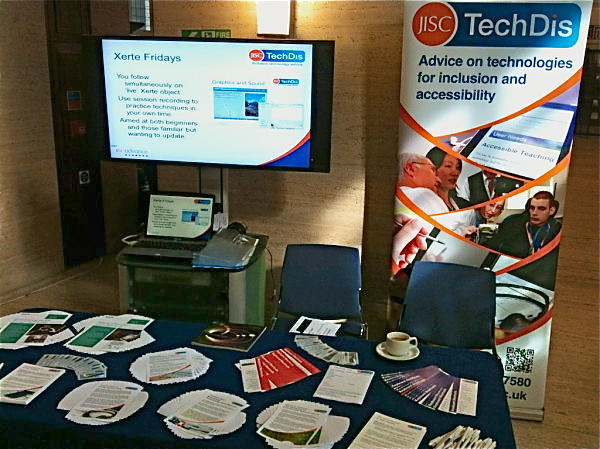 However, I did manage to rustle up enough voice to talk with the many visitors to my stand. I was there primarily to promote the newly launched ‘TechDis Voices’ and ‘TechDis Toolbox’. As before in Glasgow, Leeds and Taunton there was great interest in both products but what was interesting here in London was the fact that the range of attendees seemed to more widely cover the F.E. and Skills sector. There was equal interest from college teachers (not just the techie types, but real teachers) to ACL and WBL representatives. Many of those I spoke to here were not aware of the potential for text-to-speech or of the free tools which might allow it to happen. ACL (adult and community learning) tutors were even more excited by the range and simplicity of Toolbox, which will hopefully help their learners to better overcome and fears of technology. Sadly, my trip to Hartlepool was a little less successful due to the leaflets and banner being sent to the wrong address by couriers. It’s surprising how much these colourful artifacts do attract people to the stand. With just a laptop, a white tablecloth and two hastily created A4 notices, it was hard to attract attention of anyone. Some folks who had been involved in development did stop by and chat but very few others. Did you know that folks around here are called monkey hangers? … and the post by Rosemary Leadley, from which the video above is kindly loaned.